St. Giles was born in Athens, and he was the son of King Theodore and Queen Pelagia of Athens. Giles being humble, didn’t want the publicity of his noble birth, and withdrew deep into the forest near Nimes, in France, where he spent many years in solitude. His sole companion was a deer, who according to stories sustained him with her milk. He also lived on a vegetarian diet. 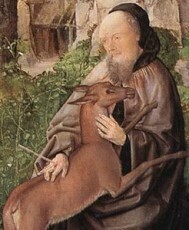 Most artwork depicts him with is deer. The King’s hunters, who had looked for a place of refuge for the night, finally discovered his solitude. The next day an arrow was shot at a deer, but instead wounded the saint, thus becoming the patron saint of handicap persons. The King, who by legend was Wamba, developed a high esteem for the hermit, whose humility was heroic. He rejected all honors, and the king built him a monastery in his valley, Saint-Gilles-du-Gard, which eventually was placed under the Benedictine rule, years later. He was eventually ordained a Priest, and became Abbot of that monastery, and a town grew around it. St. Giles fame soon spread far and wide, and many miracles were manifested with his intercession in life, and later at his tomb. He had the gift to see deeply into the soul, and on one occasion the king had not made a full confession to St. Giles. St. Giles spoke to him about the error of not making a full confession, and the king quickly corrected that and found peace. From then on, the king would beg Giles to leave his humble surroundings, but it was always in vain. St. Giles eventually died in 710 at that monastery, with the highest reputation for sanctity and continued miracles. St. Giles shows us that we can seek God out, and make Him our priority, no matter where we are born. He was born to the king and queen of Athens, but left that life and lived in solitude in a woods, so he could speak solely to God, without any disruptions from the world. He went on to found a monastery, and after being ordained a Priest, became its Abbot. He continually walked away from wealth and comfortable surroundings to live a simple life. This lifestyle won the favor of God, and was well known for his many miracles, both in life and after death; So much so, that he is recognized in the Church as one of the “Fourteen Holy Helpers”’ a group of Saints invoked with special confidence because “they proved themselves efficacious helpers in adversity and difficulties”. These Fourteen Holy Helpers are invoked as a group. Here are the “Fourteen Holy Helpers” that the Church has assembled, to be invoked as a “group” for miracles, with confidence.